The SRS iWow has had a major overhaul in the just-announced iWow-U. The iWow-U aims to deliver "substantial bass enhancement" and enhance your audio experience - no matter what you're listening to - digitally. While we're not usually too fond of digitally altering our music, there's just no denying this thing's utility during movies. Action movies especially benefit from the dongle, which makes for much more immersive audio, and you'll hear the difference as grass breaks, cars squeal to a stop, and guns are fired. Unfortunately, a show floor might not be the best place to test the intricacies of an audio enhancer, so we'll continue testing in more audio-friendly environments and update as necessary. Both the design and the connectivity has gotten a major overhaul in the iWow-U. Whereas previously the iWow connected through a 30pin dock connector and therefore was (obviously) limited to Apple products, the iWow-U uses a standard 3.5mm headphone jack which means pretty much everything with a headphone jack can benefit from what iWow is calling "HD-quality" sounds. The iWow-U design is simple and much better designed than its cartoonish precursor (the equally embarrassingly named iWow 3D). 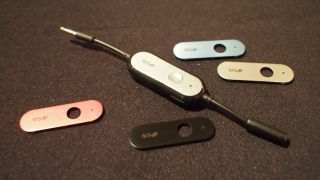 If silver's not your thing, the iWow-U comes with five interchangeable faceplates that make the unit red, blue, pink, black, or silver. There's a single button and light on the iWow-U. When the light's off, the unit's off. When you press the button once, the light turns blue and is optimized for headphone playback. Twice and the light's green, making it better for pumping out auxiliary audio systems (like a car). The iWow-U will be released in late May, where it will retail at $70 (about £43). At $70, it's not cheap, but we received confirmation that the expected street price would be lower - possibly around the $30 range.